If you could have your dream home right now, what would it look like? When it comes time to find your ideal home, you want this vision to be clear and precise. After all, it's going to be a place you spend almost every day in. The question, then, is how do you determine exactly what you want and need in your home? And why is it important to categorize your needs versus your wants? Our FREE Needs versus Wants Checklist has the answers. Not only that, it includes a printable checklist to give you the added convenience of seeing your choices laid out in front of you. 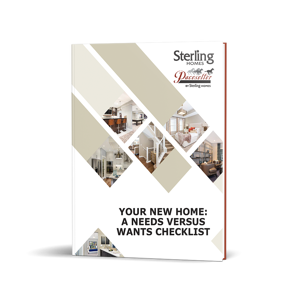 valuable tips on how to determine the difference between a "need" and a "want"
This checklist is a valuable resource for both you and your family in the planning stages, and to your builder when you decide to start house hunting. At Sterling Homes, we strive to provide you with quality homes that meet your every desire. Download our FREE Needs vs. Wants Checklist now, and you'll be one step further to living in a home that's truly your own. Just fill out the form on this page and get your free copy today!